More chocolate chip cookies, you ask? Well I apologize to those of you who are not fans of the buttery, vanilla-scented, brown sugary and totally chocolate experience known as the chocolate chip cookie. Some of you are probably thinking that I must make a lot of chocolate chip cookies. That is both true and not true. True because (as a search of any online cooking bulletin boards will tell you or a casual glance through most baking books) chocolate chip cookies are one of the most repeated yet tweaked here and there recipes out there, with everyone on a quest for his or her ideal. Like me. But it is also not true in that I tend to go in and out of phases. I will go 6 months without baking a single chocolate chip cookie, but when I am in the mood for them, I tend to keep trying different recipes, searching for that ever elusive One. As I have mentioned before I still have not found it (and I didn’t with this batch either, although it is good). Does anyone else have this experience or am I alone in this idiosyncrasy (seriously, post a comment and tell me): I fall in love with a particular chocolate chip cookie the day it comes out of the oven. The next morning I fall out of love with it because it has decreased in quality so fast. Chocolate chip cookies have a terrible shelf life and it is this fact, more than anything, which suggests to me that maybe my favorite bakery style cookies have something not so great for me in them. I thought this recipe had a bit better shelf life than most, probably because of the obscene quantity of chocolate in it, but truthfully it was still off the next day, despite having been kept in an air tight Lock-n-Lock container. So about the recipe itself: as I said it has obscene quantities of chocolate. If the thing you like best about chocolate chip cookies is the buttery, vanilla-scented dough, not the chips, this may not be the recipe for you. (Ironic aside: I much prefer the raw chocolate chip batter without the chips but when it comes to the baked cookie I want lots of large chunks of chocolate—and no I am not advocating consuming raw eggs, of course not, I, er, would never do that). What makes it really interesting is that it calls for part of the chocolate in the form of chips and part in the form of chopped chocolate, with no additional instructions. Now I don’t know about you, but when I chop chocolate I end up with tiny shards of chocolate everywhere. Even if I microwave to soften first (which I did do here) I still get a fair amount of shavings. Well these shavings melted into the dough, producing rather ugly (sorry but it is true, the dough is all muddied and the chips do not stand out) but extremely chewy, rich and chocolatey cookies. The selling point on the recipe is supposed to be how thick the cookies are–well as you can see in the photo below they are decently thick but I would not call them amazing. The first batch came out pretty nicely (that’s the one in the picture) but a later bunch sunk for no apparent reason. 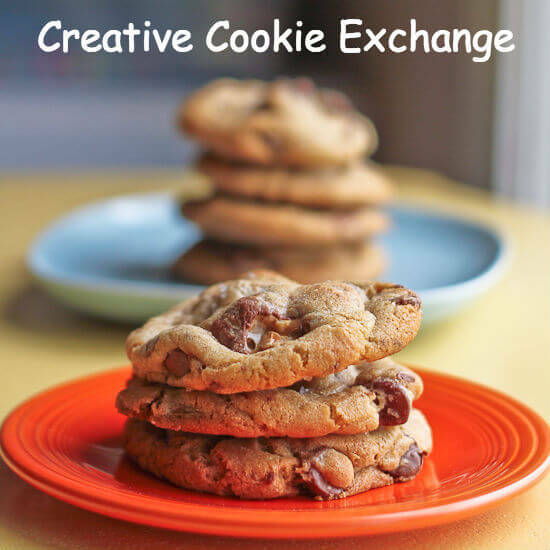 One additional note about me and chocolate chip cookies: more than any other type of recipe out there, I tend to adhere pretty strictly to chocolate chip cookie recipes. For one thing, they all have nearly the same ingredients in very similar proportions calling for pretty similar methods. So it seems to me worthwhile to follow the recipe pretty exactly, at least the first time. So this is not an adaptation of but rather the actual Marcy’s Legendary Chocolate Chip Cookie—at least as it was posted on the CLBB. On the hazards of baking with toddlers: the first cookie I bit into had a whole clove in it. Alex must have found my cloves on the counter from a different recipe and thrown them into the chocolate chip cookie dough for the heck of it. Yikes! Preheat oven to 350. Stack two baking sheets together and line the top sheet with parchment paper (ok I admit it I did not bother with this step as one of my pans was dirty). Arrange oven rack to upper third of oven. What a nice write up or reference to my recipe, Marcy’s Legendary Chocolate Chip Cookies. So glad you tried them. I did notice your photo showed rather flat cookies and I think the culprit might be…your dough was a touch warm and/or the chocolate shards were too soft or fine. I hope you try this recipe again. For me (and my 11 now-fatter/now-blaming-me) testers, the cookies are huge, thick, dense affairs. Almost an inch thick. Thanks again for such a lovely reference and congratulations on a beautiful blog. Ms. Goldman: Wow, thanks for the advice. The chocolate shards were definitely fine, I will try again and make sure to filter out the wispy pieces. I don’t think my dough was too warm but I have been wondering lately if my method of measuring flour is a little off (the dough did not seem greasy to me at all but if I remember correctly it was definitively soft). Thank you for the kind words on my blog. I have had the same quest. I still haven’t found the perfect chocolate chip cookie recipe. Guess we will have to keep trying! Love this recipe… my taste testers always beg for these! !